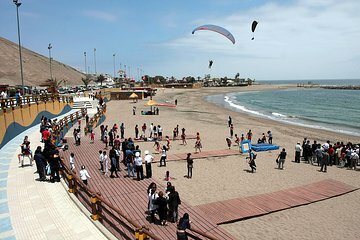 Explore the sandy beaches and historic landmarks of charming Arica on this 4-hour tour of Chile’s northernmost city, including hotel pick-up. Admire architectural gems like Gustave Eiffel’s San Marcos Cathedral and Casa de Gobierno; take in the views from the cliff top of El Morro and follow the coastal promenade to Isla del Alacràn. That’s not all: visit the fortified village of Pukará de San Lorenzo, tour the Archaeological Museum of Arica and marvel over the mysterious geoglyphs of Cerro Sombrero and Cerro Sagrado in the Azapa Valley. Tour ends at your accommodation. Due to the nature of this tour and the safety of all guests, the tour operator reserves the right to refuse service to passengers who are intoxicated or show signs of intoxication. If, as a result, your tour is canceled, you will not be entitled to a refund.